Santa wouldn't be Santa without his signature white hair and white beard. This set is one of the most affordable option for completing any of the Santa Claus costumes that we carry. This Santa Wig and Beard set feature a wig with a separate moustache and beard. Both the wig and the beard and moustache features elastic for secure and comfortable one size fits most sizing. 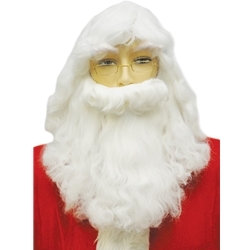 The bargain Santa wig and beard set is colored as pictured and is one size fits all. Don't forget a wig cap for a more secure fit and a wig stand to help organize your wigs and keep them neat and tidy. Glasses not included.